Often when one thinks of the steel industry, the image of sprawling mills, flaming blast furnaces, and crucibles of molten metal comes to mind. There’s a lot more to it than that, and today’s photo depicts an oft-forgotten part of the steelmaking process: acquisition of fuel. 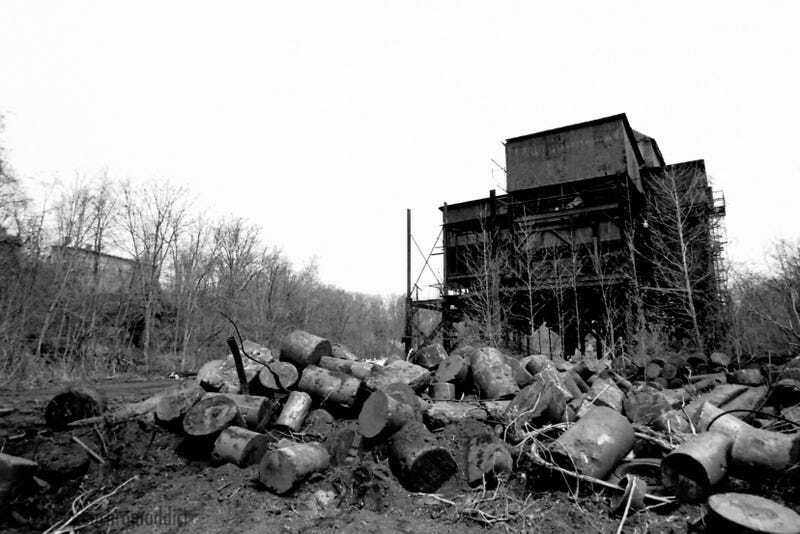 Today’s photo comes from the remains of the coke production facility at Shoaf, PA. Countless coke plants once dotted the landscape of Southwestern PA, using rows of brick ovens adjacent to coal mine sites to process coal into coke via lots of heat and fire. Coke is a fuel used in steelmaking; when burned it creates a pure, hot fire perfect for melting the metals used to produce steel. Nowadays most coke is produced in massive industrial complexes, but during the industrial revolution it was produced in small facilities like this one at Shoaf. Most of these places were abandoned before the Great Depression (they weren’t very efficient and produced LOTS of pollution) but Shoaf soldiered on until the 1970’s. This photo shows the coal breaker (building full of machinery used to break coal into smaller, more manageable pieces) standing behind piles of graphite discarded by another company that had later used the land. For more info about Shoaf, look here. More daily photos on my Flickr and Instagram pages.